Recently a lovely little article appeared in my Facebook feed which invited me to cultivate my inner plant. This was not to be an exercise in anthropomorphism, stated its author, but an opportunity to “vegetalize your already more than human body”. And as I read these words, I realized I had finally found a way to contextualize (and put into practice) my growing fascination with the yoga of time. Not grand cycles of time like the Yugas, but the monthly, daily, even hourly cycles that regulate our biological clock. Like plants, our cells contain cryptochromes (light-sensitive proteins) which respond to the rising and setting sun and changing moon phases. And plant geneticists and biologists speculate that these genes are why the same cycles of time that regulate the growth, rest and reproduction of lettuce, trees and flowers, govern our metabolic processes as well. Was this I wondered, why ancient Vedic and Ayurveda texts put so much emphasis on harmonizing human activity with the cycles of the sun, moon and solar system? Today their teachings on propitious hours, days and moon phases for meditation, sadana and asana has largely been washed out of modern yoga practice as irrelevant superstition – yet the new science of Chronobiology increasingly confirms that within every moon phase and daily cycle – there are peak times for everything. 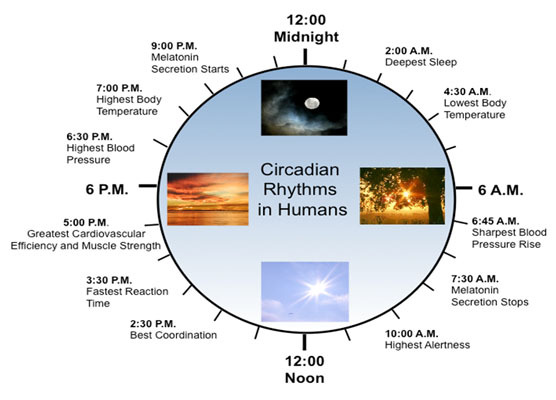 Chronobiology (meaning biology and time) suggests that solar and lunar cycles DO create real fluctuations in our bodies and brains, regulating physiological processes such as sleep wake cycles, hormone release, body temperature, neurotransmitter activity and other important bodily functions. Indeed research compiled in Michael Smolensky’s book The Body Clock Guide To Better Health lends support toVedic texts which tell us that when it comes to maximizing our full potential, timing is everything. Smolensky is the director of the Hermann Hospital Center for Chronobiology and Chronotherapeutic Studies, and he asserts that fluctuations in our circadian rhythm, a roughly 24 hour period (following the earth’s rotational cycle) leaves us better performing certain tasks at certain times. For example, morning are best for tackling mental tasks because mental alertness and concentration peak from 9am and midday and wane in the early afternoon (best time for taking a nap). And because our muscular strength, pain tolerance and physical strength peak at about 3pm to 6pm Smolensky suggests this is the time to perform strength and agility based exercise. Does this lend support to ancient Vedic texts which divide each of the 24 hours into kapha, pitta, and vata periods during which the predominating qualities of those doshas are prevalent? The three doshas are said to be the equivalent of Sun, Moon and Air energies of our body. And in the great healing tradition of Ayurveda, aligning ourselves with these energetic qualities starts with getting up in the morning. The period before sunrise is related to Vatta, and is known as the Brahma Muharta or “ambroisal hours. And one of the very first Ayurvedic texts advises :”One should wake up in the Brahma Muhurta for sustaining perfect health and for achieving a long life span, as desired.” Conversely waking later was believed to contribute to lethargy, fatigue and a host of physical disorders. So could waking up during Brahma Muhurta actually help synchronize our natural clock? Ancient Vedic texts are also full of instructions on observing the cycles of the moon. Different phases of the moon were believed to have different energetic forces that could be harnessed through appropriate breathing exercises or meditations. And again, while we regard these idea’s as folklore, studies referenced by Douglas Rushkoff in Present Shock, When Everything Happens NOW suggest that our brain is dominated by a different neurotransmitter during each moon phase. And while this research is still far from definitive, there is evidence that at the beginning of the new moon acetylcholine (associated with heightened attention) is predominant, nearer to the full moon a uptake in serotonin occurs (the feel good chemical that gets boosted by anti depressants) and as the moon wanes our dopamine (responsible for reward driven learning) increases. Finally in the last moon phase we are dominated by norepinephrine (an arousal chemical that regulates the flight or fight response, anxiety and other instinctual behaviors). So is it so far-fetched to consider that guided by the moon phases, the yogi’s various rituals, sadhanas, and proscriptions, might have indeed intensified states of consciousness or even altered their biology? I’ve given only a few of the examples of research which supports ancient contentions that living in sync with daily, monthly and hourly cycles benefits us physically, emotionally and mentally. And this is important, as Rushkoff points out, because most of us live, work and sleep in artificial environments oblivious to the hundreds of thousands of years of human evolution that have cued “everything from our thyroids to our spleens to store, cleanse and metabolize at appropriate intervals.”And as chronobiologists have found, this is directly linked to epidemic problems as sleep disorders, depression, dementia , diabetes, and obesity – to name but a few. As a yoga teacher and practitioner this concerns me because most of us also practice yoga this way. We perform the same routines and sequence of postures day in and day out – paying little attention to the effects on our physiology of the changing hours, days and moon phases. And to me it suggests that we’re missing out on a vital component of Hatha Yoga (the mother of modern practice), one that emphasizes the importance of “yoking” our being to solar (Ha) and lunar (tha) cycles. So an obvious question arises, could aligning with natural cycles actually enhance the effectiveness of our yoga practice? 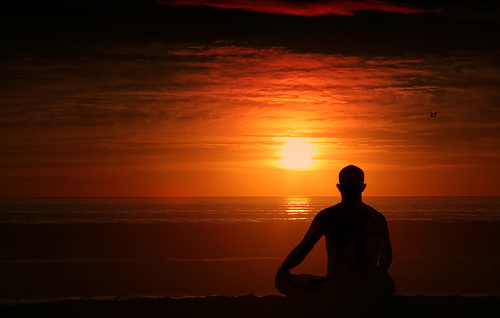 Since mental concentration is high in the morning does it make it a good time for mediation? And because muscular strength and concentration fall in early afternoon- is it an ideal time for restorative yoga? And is late afternoon (when physical performance peaks and the risk of injury drops) the best time for a more energetic power yoga workout? Now I want to acknowledge that it’s really not as simple as all that. 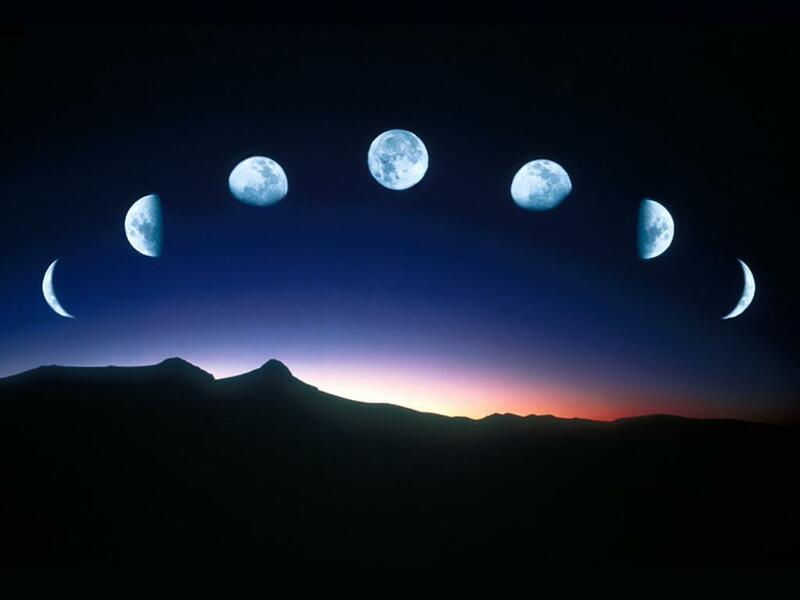 The changing moon phases affect the appropriate times for differing activities each day. For example in the new moon phase, people will be most alert during the early morning hours, while in the second phase leading up to the full moon, people function best in the afternoon. Further complicating matters is the fact that everyone’s body clock isn’t the same. Chronobiological research demonstrates people operate on either of two distinctive chronotypes, morning people tend to wake up and go to sleep earlier and to be most productive early in the day. Evening people tend to wake up later, start more slowly and peak in the evening. So I wondered, beyond someone inventing an App that meshes our chronotype with moon phases and circadian rhythms was there a simple way to put the yoga of time into practice?And this brings me back to the lovely plant embodiment exercise with which I introduced this post – because it granted me a clarifying epiphany. The answer was within the body – as always. 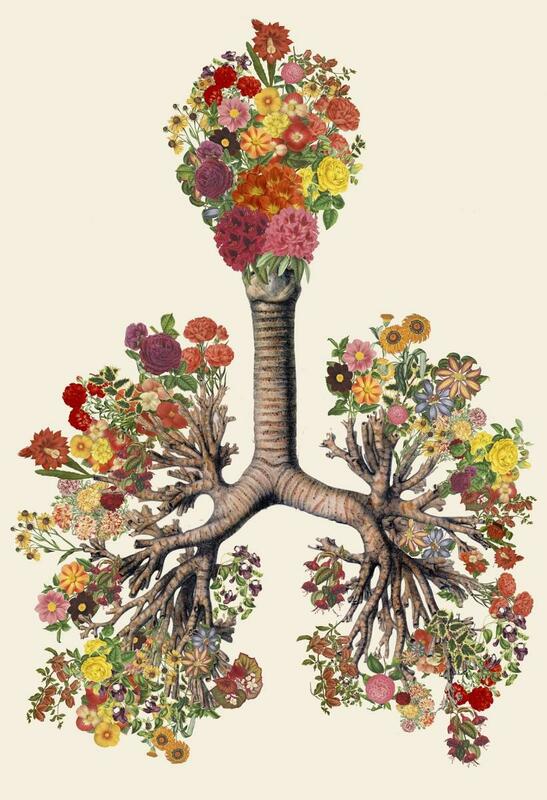 I love this because it encourages us to sink deep down into the innate wisdom of our cells. It invites us to “acquire a bodily memory of the play of light and colour as they change over the seasons”. 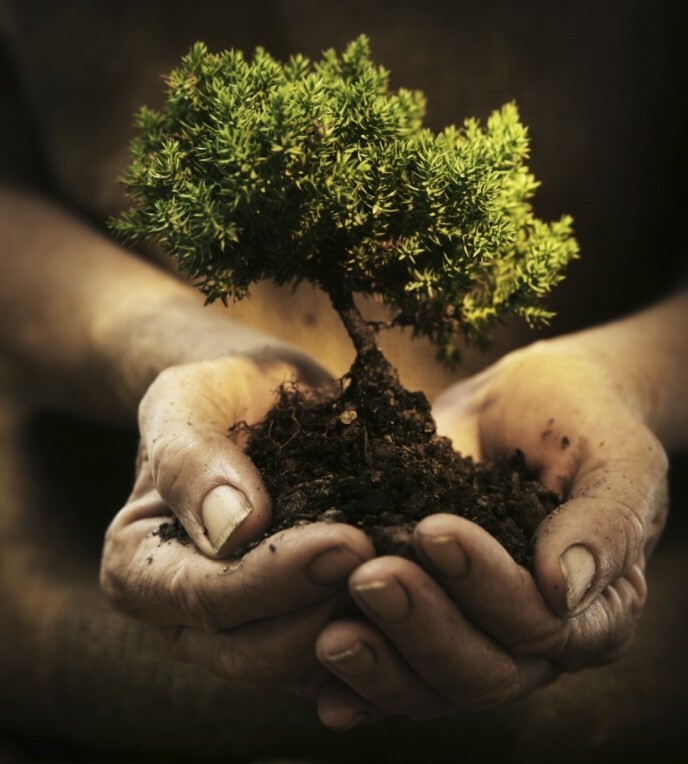 And it suggests that by cultivating our inner plant we can reconnect with our nature as beings in time, we can begin to instinctively sense and move in harmony with the cycles of time that regulate all life on the planet. Fantastic read! Love the information and concepts detailed. I’ll be doing some more reading and contemplating about this! Thanks! Lots of wonderful ideas in here. Thank you so much for writing it. Really nice article, I like your whole blog you write thought provoking articles! I’ve noticed how the moon affects me, I found the different times of the day intriguing, while reading your post I was wondering what your answer was going to be. I particularly liked the emphasis on coming back to ourselves, feeling and listening to our body.